There are almost 275,000 acres of corn planted in South Carolina, with an economic impact of approximately $130 million. Though this is dwarfed by Midwest states such as Iowa (13.7 million acres, $8.75 billion), it's still a lot of corn - enough, at least, to make a person think S.C. would be a utopia for the insects that like to feast on tasty yellow kernels. But instead of being a slice of paradise, a cornfield can often be a far-from-optimal host for pests such as the corn earworm. Francis Reay-Jones, an associate professor and research scientist for Clemson University, is striving to keep it that way. "I work on insect pest management strategies and make recommendations specifically tailored for farmers in South Carolina," said Reay-Jones, an entomologist who is based at the Pee Dee Research and Education Center near Florence. 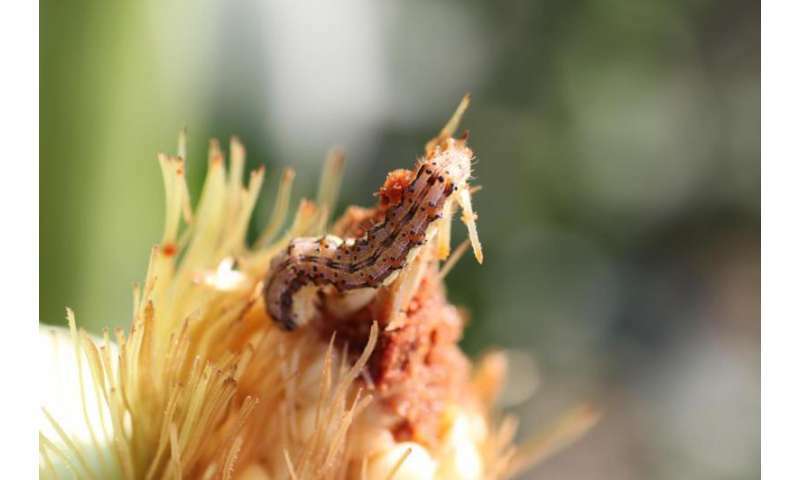 "In addition to the corn earworm, another key pest of corn is the fall armyworm that arrives in our state after overwintering in the Caribbean and south Florida. They fly north throughout the U.S. every year - and when and where they show up is really difficult to predict." Funded partially by a grant from the USDA in collaboration with N.C. State's Dominic Reisig and other colleagues, as well as a five-year Hatch project (SC01700519) titled "Ecology and Management of Arthropods in Corn," Reay-Jones is conducting ongoing research involving genetically modified corn expressing Bacillus thuringiensis (Bt) toxins. Produced by the plant as opposed to being applied by external means, these toxins are effective against corn borers while also suppressing or controlling corn earworms, fall armyworms and several other pests. Bt corn seed first hit the U.S. market in 1996, and several products expressing different toxins sold by large seed companies are currently used. "We are continuing to look at how injury from these insects impacts the yield of Bt hybrids," said Reay-Jones, who also conducts trials at Edisto Research and Education Center in Blackville. "Over the years, the seed companies have released hybrids with new Bt toxins or hybrids expressing multiple Bt toxins (known as pyramided Bt corn), and it's important that we continue to test them, as toxins vary in how they affect corn earworms and fall armyworms. There's a real benefit in having university scientists provide unbiased recommendations." When it comes to nature, nothing lasts forever - keeping scientists on their toes. Reay-Jones and his collaborators across the nation are charged with keeping a close eye on changes in susceptibility to Bt toxins. When an insecticide is first used, a small proportion of the insect population might survive exposure because of a particular genetic makeup. With repeated use of an insecticide, selection pressure can lead to an increase in the population of resistant insects. What this means to corn growers is that there is always a risk that the proportion of the ravenous pests that has already developed resistance to the Bt toxins will grow from relatively small to catastrophically large. A recent study published by Reisig and Reay-Jones showed that Bt corn expressing Cry1Ab toxin had less of an effect on corn earworm now than it did in the late 1990s, suggesting that changes are happening in the field in regards to how susceptible corn earworm is to this Bt toxin. "Although Bt corn expressing Cry1Ab was developed to control the European corn borer, it also provides some control of corn earworm feeding on corn ears," Reay-Jones said. "Some laboratory data and our recent study suggest that there have been changes in susceptibility of corn earworm to this toxin in some parts of the country." As a direct follow-up to this work, N.C. State, Clemson and Mississippi State have been funded by the USDA grant to look at the ecology of corn earworm on corn, soybean and cotton - three major crops that suffer from damage by corn earworm. The corn component of the grant is examining the impact of Bt traits on survival and fecundity of corn earworm. "We collect corn ears - when we know we have big larvae that are about to pupate - and put them in plastic boxes with soil, and then the larvae fall to the soil to pupate and we sift them out," Reay-Jones said. "We can't do that in the field. It's too complicated and takes too much time. And so it's a rather simple way to get some nice data from these Bt and non-Bt hybrids. We then use the data to look at how these traits impact the production of pupae and fecundity of moths." Though detrimental to corn earworms, the toxins produced by Bt corn hybrids are harmless to humans. The plant expresses the toxin through its leaves, silk and kernels. "Eggs are laid on corn silks, and young larvae quickly enter the ear, which makes them particularly difficult to control with applications of insecticide," Reay-Jones said. "So having the plant express the insecticide can be an effective way of controlling the pest, depending on which Bt corn trait is planted. 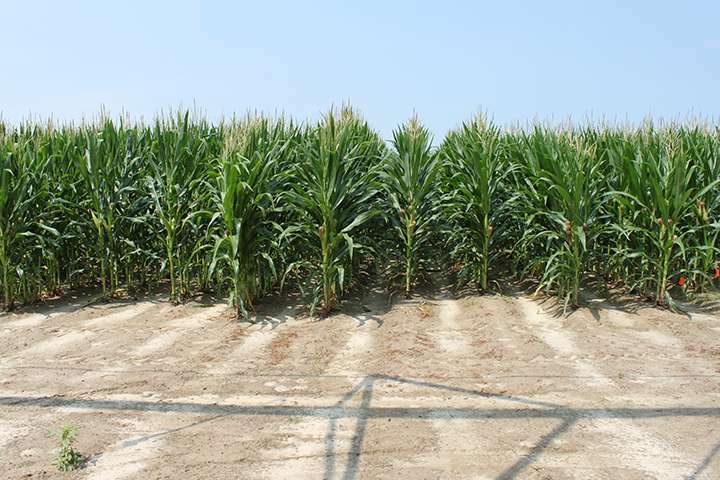 Growers that plant Bt corn are also required to plant a portion of their total corn acreage with a non-Bt corn hybrid as part of an insecticide resistance management strategy to help delay the development of resistance. The efficacy of Bt corn needs to be sustained by complying with these mandated refuge requirements. On-going studies aim to detect resistance before field failures occur, as well as provide information on pest biology that will help to improve resistance management strategies."